A relative newcomer to the home-audio market, Bag End has enjoyed an excellent reputation with pros and musicians alike for two decades. Over the course of the last few years, Bag End has done an excellent job of getting their name known to audiophiles, but to my knowledge, I dont have a single acquaintance that has ever heard one much less owned one. For that reason, I welcomed the opportunity to review a Bag End subwoofer. Their first product developed specifically for the home-audio/theater market and the subject of this review is the Infrasub-18, a self-powered subwoofer system employing a direct radiating 18" cone in a sealed enclosure with a 400W power amplifier. What sets the Infrasub-18 apart from the rest of the subwoofer pack (aside from the whopping 18" driver it uses!) is that it reportedly delivers a frequency response down to an ultra-low 8Hz. No, thats not a typo -- 8Hz! Equally unique is the method used to obtain its low-frequency extension, a little elfin magic. No, Bag End has not recruited Santas best elf. In this case ELF stands for "Extended Low Frequency" and is achieved through the use of a circuit that Bag End calls the "ELF Dual Integrator." Basically, this is a proprietary (and patented) method of applying active equalization to the subwoofer. The "Dual Integrator" tracks the woofers natural frequency response and employs just enough EQ to render it flat down to 8Hz. Regarding the Bag Ends 8Hz bass extension, dont get too excited about that. Bag End is the first to admit that there is nothing to hear that low and nothing to feel. In fact, the Infrasub-18 isnt incapable of putting out a high enough SPL at that low a frequency to be meaningful. "So why bother?" you may ask. Well, Bag End figures that if the sub extends well to 8Hz then it will have enough headroom a full octave up the scale to handle a 16Hz pipe-organ fundamental. But, just for fun, I pulled out some Telarc CDs with content down to 5Hz. As expected, I could neither feel nor hear anything that low, but I confess that it was fun to watch the woofer cone gyrate at that low a frequency. It wasnt, but it looked as though it was completely out of control. Its not very often that you get an opportunity to witness such a spectacle! Otherwise, the Infrasub-18 appears to be your average (albeit somewhat large), almost cubical subwoofer box finished in a utilitarian matte-black vinyl. While Bag End offers the sub in optional finishes including Walnut, Oak, Rosewood and Maple, I have to say that I find basic black to work very well (unless you can match your speakers exactly) and it saves big money. Turning attention to the rear of the sub one will find that the controls and connection hardware has been kept to the bare minimum. There are two controls for the user: a volume control and a two-position (+/-) phase control. Input connection is accomplished via either spring-loaded, speaker-level inputs or by three RCA line-level inputs (left, center, and right). Rounding out the compliment are three corresponding RCA outputs that place into the signal path a fixed 95Hz crossover (there are no speaker-level outputs). A detachable power cord, a rocker-style on/off switch and a 220V/115V-power transformer switch finish the list of accoutrements. One thing that I really liked was the fact that the amplifier module is mounted to an aluminum plate which is mounted onto the rear of the subwoofer, as opposed to inside the enclosure. Should service to the amplifier ever be required, this makes access to it much easier and seems to allow for better cooling too. Two things that disappointed me were the fixed 95Hz high-pass filter and the lack of an "auto-on" circuit. For home-theater enthusiasts, the lack of an adjustable filter presents no problem at all as the surround processor performs bass management duties. However, since Im an audiophile too and given the marvelous performance I observed from this sub, a variable filter would allow a much greater degree of flexibility in mating the sub with speakers. While the sub showed no ill effects after being continually powered up for four months, the peace-of-mind of knowing that it was turned off when I was not around would have been welcomed. In my experience, even with the increased popularity of subwoofers (mostly due to home theater), they are still the most misunderstood of audio components. I have well-informed friends that tell me that they dont want a subwoofer based on how bad most subwoofers sound at in-store demos. Now, I do acknowledge that in-store demos of subwoofers are extremely difficult from both the standpoints of prospective customers and salespeople. The salesperson is expected to meld a subwoofer with any speaker in the store at the drop of a hat. This is no easy task. Achieving a seamless match with a speaker requires finding the proper crossover frequencies, proper room placement of the subwoofer, as well as the (very subjective) proper volume setting on the sub. Furthermore, its the subjective nature of this "proper volume" that is the problem. Ask three different people to find the proper volume level for a subwoofer, particularly if based on a short-term listening session, and you can get three different volume settings. A good subwoofer can be an asset in all but the largest and most expensive systems, whether those systems are intended for two-channel audio or multichannel home theater. Ive been using subwoofers for years for their ability to extend the dynamic range of systems using small (ten inches or smaller) woofers and to give me truly subterranean bass when (and only when) called for. Most importantly, subwoofers allow me to place the main speakers for best imaging, soundstaging, and midrange clarity while placing the subwoofer for the cleanest and tightest bass (a single location within the room almost never gives you both). But where does one find a good subwoofer? Well, read on and let me tell you about one well worth your consideration. When I received the Bag End Infrasub-18, I was in the middle of evaluating a pair of stereo speakers as well as a full compliment of home-theater speakers. Still, I was anxious to get a listen to this beast. Initially, I inserted it into a system comprised of a pair of Tyler Acoustics Taylo Reference Monitors, Classe 5 preamp, Classe CA100 power amp, Sony DVP S500D DVD player feeding a Meridian 563 DAC digital system and the Sota Jewel/Premier FT3/Sumiko BPS analog system. Wires and cables were DH Labs Silver Sonic T-14 speaker cables (biwired), BL-1 interconnect, and D-75 digital cable. Vibrapods were used under all electronics. Right out of the box the Bag End sounded superb. It was powerful, extremely detailed and while this may seem an oxymoron, it sounded fast. Equally important, it blended with the Taylo Reference Monitor seamlessly and instantaneously. Eventually I used the Infrasub with a pair of Silverline Sonatinas, ACI Sapphire IIIs and the Tyler Acoustics 7U. Use with all of these speakers resulted in equally excellent results. Using the integral active crossover between the pre and power amp, the Infrasub proved to be an excellent addition to every system and always sounded superior. One of the lesser known benefits of a good subwoofer is the increased sense of hall ambiance they can add. Few realize how much spatial information is stored on the back of bass frequencies. In this regard the Bag End really excelled. It was as tight, tuneful and as articulate as my reference ACI Titan, but performed with a greater sense of power and ease than the Titans 12" woofer could hope to. It also outperformed my Velodyne ULD 15 in terms of articulation and freedom from audible distortion. Eventually the Infrasub-18 made it into the home-theater system. Ill be the first to admit that movie soundtracks rarely have bass content below 30Hz or so. On paper the Bag End looks to be gilding the Lilly, but this is not so. In the theater bass power rules and, all else being equal, an over-achieving subwoofer just sounds better. Where bass is concerned, it seems that there is no substitute for size and power. A larger woofer just sounds more powerful than a smaller woofer, even when playing at the same volume. There is a sense of ease that only a true subwoofer can give you and as its operating below its ultimate capabilities, it does so with less distortion. This is the key. Unlike music, where deep bass tones are transient in nature (bass drum whacks, plucked double basses, etc. ), bass in the theater is not. Frequently, the bass found on movie soundtracks is of a longer duration, (helicopter/jet engines, bomb blasts that are repeated several times in succession, etc.) 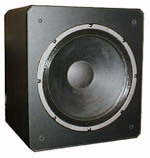 which demands higher output capability of the subwoofer with a low level of distortion. Keep in mind that while the ear is notoriously insensitive to distortions at or below 30 Hz, a disfigured 30Hz tone produces lots of harmonic distortion at 90Hz, and that is well within the ears ability to discern. It is to that relative lack of harmonic distortion that I attribute the sense of ease intrinsic to larger and more powerful subwoofers. What Im after is a visceral sensation that assaults the body and completely energizes the room before it overloads the ear. If you have ever heard a pipe organ you know what Im trying to say. You feel the power as it energizes the floor and your seat while it penetrates your being, but you do not have the sensation that you are hearing something all that loud. To get that kind of room and body excitement with a smaller sub you have to turn it up so loud that it sounds loud and, if you are smart, your ears tell you to turn it down. But a larger subwoofer, such as the Infrasub-18, sounds (or should I say feels) more like the real thing. My theater electronics include the Yamaha DSP-A1 amplifier, a Marantz LV520 Laser Disc player and a Sony DVP-S500D DVD player. With the Yamaha A1, Bag Ends suggestion of inserting the Infrasub-18 between the left, center, and right preamp outputs and power amplifiers was extremely inconvenient, so I opted for the more typical set up. I connected it to the LFE output and set the processor to "small" speakers all around. Had I been disappointed in any way with the subs performance, I would have found a way to comply with Bag Ends recommendation, but I was not. In a word, it sounded exquisite. Movie after movie, concert video after concert video, the Bag End Infrasub-18 was unflappable. Most often it performed like it wasnt even there. Like the true team player it is, it performed its duties without ever calling attention to itself. Bass was there and in good form, but it allowed itself to be taken somewhat for granted. For instance, in The Hunt For Red October the scenes from within the submarines are accompanied by a steady bass drone. With the Bag End the sound was so natural it became almost subliminal. Ditto on Erasure where the soundtrack contains a steady stream of bass lines, all of which sounded smooth, powerful and pure. But when given the chance to get rowdy it did so with ease and aplomb. Erasures shoot-out at the shipping yard was exciting with the gunfire and gut-wrenching explosions. L. A. Confidential s final shoot-em-up scene at the old house is another favorite demo since those shotgun blasts can certainly pack a wallop. Forgive the pun, but on movies, the Bag End was a blast. The opening battle scene from Lost In Space was loud, powerful and robust. And no audition of a subwoofer would be complete without a showing of Armageddon with its copious amounts of potent, condemned asteroid bass rumble. It was all well produced over the Bag End. So, was the Bag End the perfect, end-all, be-all subwoofer? Almost. To be fair to the Bag End, I had entered the last stage of the review process before I received my first reason for pause. Before I wrapped things up I wanted to see just how loud this puppy could bark. As it turns out, I was just about already at that point. There was not much more room-shaking, gut-curdling, girder-crumbling volume to be had. Up until this point, it had given me everything I had asked of it, but I was at the end of the line. I spoke earlier of the sense of ease common to large subwoofers and I guess it is to the Bag Ends credit that I had never heard a hint that I was at the end of the line. But I still have to say that on the mightiest of sound effects, the sub didnt quite give me the kick in the pants that I expected of a monster sub. While its output is plenty for just about any sane listener, when goosed, I just expected it to excite the room a bit more than it did. Although nothing has outstripped the Bag End in bass extension, Ive heard more raw power from a pair of NHT 2.9 loudspeakers. The Polk RT3000 speaker system possessed the best punch of any theater system Ive had through here and both bettered the Bag End in these regards. But dont misunderstand, the Bag End played more cleanly and with more extension than just about any sub Ive ever heard. At its price and size (for an 18" sub, the cabinet was actually rather small! ), there had to be a trade-off and Bag End seems to have opted for quality over quantity-- a choice Ill get behind every time when it results in sound this good. And, hey, if you want more output, at the low price of the Infrasub, you can take two. By any measure, the Bag End is a terrific subwoofer and a fantastic buy. On music it is on a par with any subwoofer Ive ever heard, and it beats any subwoofer Ive had in my house. Equally important, it blended well with any speaker I threw at it. I unhesitatingly recommend it for home theaters where music is a priority. On movies its talents are not wasted either. Its robust and controlled performance makes the Infrasub-18 a worthy addition to the most high-end theater speakers out there. If you have yet to hear a Bag End, make it a priority.